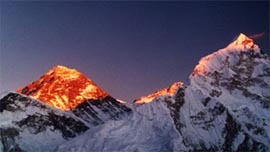 Wedged between the high Himalaya and the steamy Indian plains, Nepal is a land of snow peaks and Sherpas, yaks and yetis, monasteries and mantras.The Nepal Himalaya is the ultimate goal for most mountain lovers. 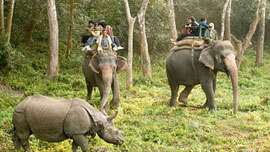 Chitwan literally means “heart of the jungle”. 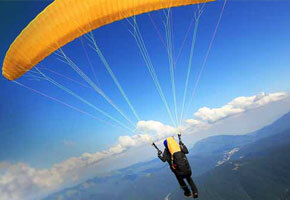 In recent years Chitwan tops the list of things to do in Asia. It is a truly wildlife adventure of a different kind – jungle safaris on elephant backs or jeeps, birdwatching, canoe rides and jungle walks. The Chitwan National Park is Asia’s best preserved conservation area, where wildlife thrives and their habitats remain intact. 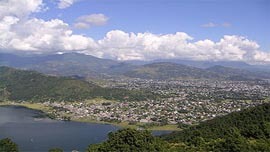 Only half-hour flight from Kathmandu, the park lies in the Inner Terai lowlands and consists of Sal forests, tall elephant grasslands, hills, ox-box lakes and flood plains of the Narayani, Rapti and Reu rivers. Enlisted as a UNESCO World Heritage Site (Natural) in 1984, the park spreads over an area of 932 sq. km. 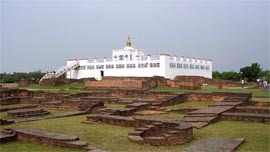 Lumbini, the birthplace of Lord Buddha, in the Terai plains of Nepal is one of the greatest pilgrimage sites for Buddhists. More than 400,000 Buddhists and non Buddhists visit Lumbini every year. It is also a UNESCO World Heritage Site (Culture) and holds immense archeological and religious importance. Sacred Garden,It was here in the gardens of Lumbini that Prince Siddhartha Gautam, who later became the Buddha, was born in 623 BC. The nativity site is marked by a commemorative pillar erected by Mauryan Emperor Ashoka of India during his pilgrimage to the holy site in 249 BC. JANAKPUR, the birthplace of Janaki or Sita, the consort of Lord Ram, is an important religious pilgrimage site in the Terai plains, in south central Nepal. In ancient times, Janakpur was the capital city of the Kingdom of Mithila and the centre of Maithil culture during the Treta Yug, or period, nearly 12,000 years ago. 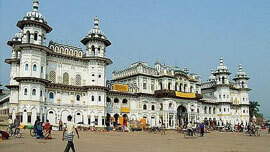 Janakpur has held a special significance for Thai Royal families since ancient times. The Royal household of Thailand still receives mangoes from the orchards of Janakpur. These fruits which are in abundance only during the peak summer months from May to mid June are savored for their sweet taste and unique flavor.